The LED Illusion Lamp is a combination of art and technology that creates an optical 3D illusion. 3D Illusion: 3D visual impact makes your room more interesting. Touch Sensitive: Gentle tap to control the switch or change light colors. Colorful LED lights: with two modes: steady on/ changing color. The light creates a romantic atmosphere which can help you relieve pressure and sleep. USB Powered: Come with USB cable, the table lamp could be charged with Power Bank, USB Wall Charger and Laptop; also could be supplied USB Powered: Come with USB cable, the table lamp could be charged with Power Bank, USB Wall Charger and Laptop; also could be supplied USB Powered: Come with USB cable, the table lamp could be charged with Power Bank, USB Wall Charger and Laptop; also could be supplied by batteries. 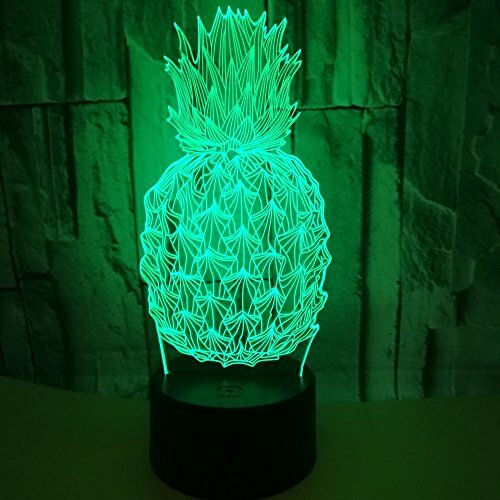 Perfect Decoration: This pineapple design night lamp can be applicable to office, bedroom, baby room, cafe, restaurant, living room, bar, shops as an atmosphere light. If you have any questions about this product by Yooce, contact us by completing and submitting the form below. If you are looking for a specif part number, please include it with your message.